A trip to New York City just wouldn't be complete without a tour of the Statue of Liberty. Nestled on the 12-acre Liberty Island, the "Lady Liberty" is the matriarch of our country, emphasizing freedom and liberties for all. It is important for children to learn and understand the history of our country and the guided tours of the Statue work to provide families with this knowledge. When you order tickets by Circle Line by mail, e-mail or telephone, make sure that you include "Time Passes." Since the Statue of Liberty opened in August of 2004, safety regulations have limited the number of visitors into the pedestal. The "Time Passes" are free, however, they act as reservations to enter the Statue's pedestal - no one is allowed in the statue because of fire and health reasons. 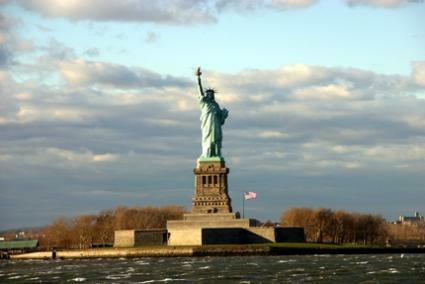 Visitors arriving at Liberty Island have the option of two tours to view the Island and the Statue of Liberty. The Observatory Tour of the Statue of Liberty takes the tourist on a ranger-guided quest through the basics of the park. The tour begins in the monument lobby where guests are allowed to view the original torch of the Statue of Liberty. A 7 to 10 minute lecture accompanies the exhibition. The next stop is the three wing exhibit on the history of the Statue, the symbolism and the way the Statue of Liberty Enlightening the World - the correct name - is interpreted throughout the world. Guests opting for this tour are now able to visit the pedestal observation platform where they can learn about the interior make up of the Statue of Liberty. Visitors can even peer through glass ceilings to examine, explore, and learn more about the framework created by Eiffel, yes, the same engineer who built the tower later in Paris. The tour then proceeds outside to the lower promenade and Fort Wood. Once outside, the guests receive additional information from the tour guide and are able to take in the views from the harbor. Ranger Guided Tours of the Statue of Liberty and Ellis Island are also available. Whether or not they are an option for tourists, however, is dependent on the availability of staff on a particular day. All ranger-guided tours are on a first come, first served basis and there is no charge. Therefore, it is important to plan accordingly if this is something of interest to the family. This tour takes guests on a 45-minute scenic journey of the Island and the Harbor and leaves on the hour at the Flagpole. While on the tour, guests are introduced to the overall history of the Statue of Liberty. Information is presented in regards to the construction, conception, and the restoration of this national monument. Park Rangers who serve as guides for the tour are also available to answer the questions of inquisitive children. Although the Statue of Liberty remains a spectacular sight to see, it is important for children and adults to understand its true history. The Museum is a fantastic place for families to visit while learning more about its history at their own pace. The museum seeks to inform and educate in a variety of ways, though most information is presented in a visual manner. Photographs, prints, and videos are just some of the ways children can learn more about Lady Liberty. Along with all the history that comes with the visit, children are awed at the life-sized replicas of the Statue's face and foot they can explore inside the museum.